If you live or vacation in an area patrolled by mountain lions, you should take precautions - recommended by authorities - that can reduce your risk of attack on you and your family as well as your livestock and/or pets. Even though mountain lion attacks on humans are rare (see Mountain Lion Attacks), you should nevertheless avoid taking unnecessary risks. In and near your yard, especially near play areas, clear out vegetation that would otherwise provide cover for a stalking mountain lion. Consider installing a 6- to 8-foot high deer-fence as a deterrent around play areas. Keep children indoors around dawn and dusk, the favorite times of day for a mountain lion on the hunt. Do not feed wildlife that would be potential prey for a mountain lion. Do not landscape with plants that would attract deer, the favorite prey for a mountain lion. 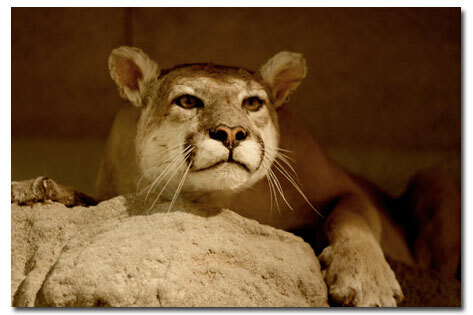 Install outdoor lighting, especially near sidewalks and pathways, discouraging stalking by a mountain lion at night. Scatter mothballs and ammonia-soaked scraps of cloth around your yard. Hike with a group, not alone. Hike with a dog on a leash, which may be the first to see a mountain lion. Keep children, especially small ones, under close watch, particularly around dawn or dusk. Carry a walking stick or pepper spray, which might serve as deterrents. Do not approach a mountain lion, especially a kitten (its mother may be nearby). Gather and protect your children. Keep eye contact and back away slowly, without running - an act that might trigger a mountain lion's pursuit instinct. Act aggressively, looking large, waving your arms, shouting, throwing stones or branches. Give the mountain lion an avenue for escape. If attacked, try to keep facing the mountain lion and fight back with your walking stick, pepper spray, stones - any weapon that comes to hand. Enclose high value larger animals in a barn or within a 10-foot high, strong-gauge wire fence with the bottom buried several inches below ground and the top protected by an outward-facing and barbed extension or by an electrically charged wire. Enclose smaller animals in strong-gauge wire pen with a covered top. Keep pets in secure quarters from sunset to dawn. Keep pet foods indoors from sunset to dawn. Install a strobe light/siren electronic guard, a device that has been developed by the U. S. Department of Agriculture's Wildlife Services. If a mountain lion should become a serious problem, you may have to contact the appropriate state or federal agency to dispatch the animal. Do mountain lions attack people? Do mountain lions attack livestock and pets? How can I protect my family as well as my livestock and pets from mountain lion attacks? Where to mountain lions live?